Driving in an unfamiliar area can be confusing and sometimes it doesn’t take long to get turned around when everything looks the same – the app will take you back to your car just as the car's onboard navigator provides guidance to somewhere you have never been. Maybe you’ve had one cocktail too many and it’s better you don’t find your way back to the car? The app will call a cab for you with a single touch and works with iPhones and iPads across several generations, providing the device is using iOS 5.0. One local music venue is in a sizable business park with many towering, shiny buildings on curved streets – all with huge parking lots. When attending a show at this venue, fans would park in one of the building's parking lots and enter through the ticketing gates during daylight. At the end of a rollicking concert, the crowd was ushered out a side exit into the dark surrounding buildings and massive parking lots. Some things look completely different in the dark - especially in an unfamiliar part of town. Consequently it could take some folks an hour to find their car, having failed to make adequate mental notes on the car’s location. 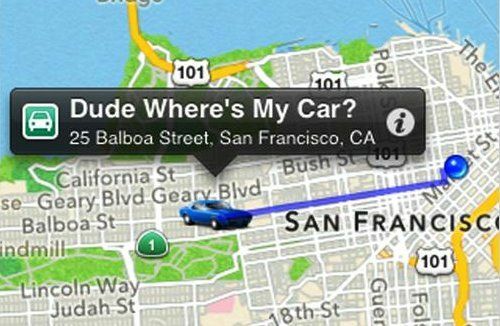 The Dude, Where’s My Car app will solve this sort of problem. Still to come, another feature will sync the app with a Bluetooth device that plugs into the car's power plug, marking the car’s location without having to remember to open the app every time. You can download this free iPhone app by clicking here.